Our range of services include nitrogen generator. We are offering wide range of Nitrogen Generator. Our offered range is widely appreciated by our prestigious clients for their precise design and durability. The dry air passes through the aluminium tower where oxygen is adsorbed into the molecular sieve and pure nitrogen is let out. Part of the produced gas is used for regenerating the sieves. 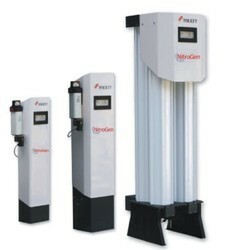 Looking for Nitrogen Generator ?